What do you see when you think about the 1950s? Do pictures of sock hops and poodle skirts pop into your head, or are you more of a “hot rods and leather jackets” kinda gal? They're all pretty great looks, and no era did fashion better than the '50s, after all! If you're looking for a fun and flirty style that's hip in any crowd, check out this Ladies '50s Costume dress, and you'll be one cool looking cat, Suzy-Q! 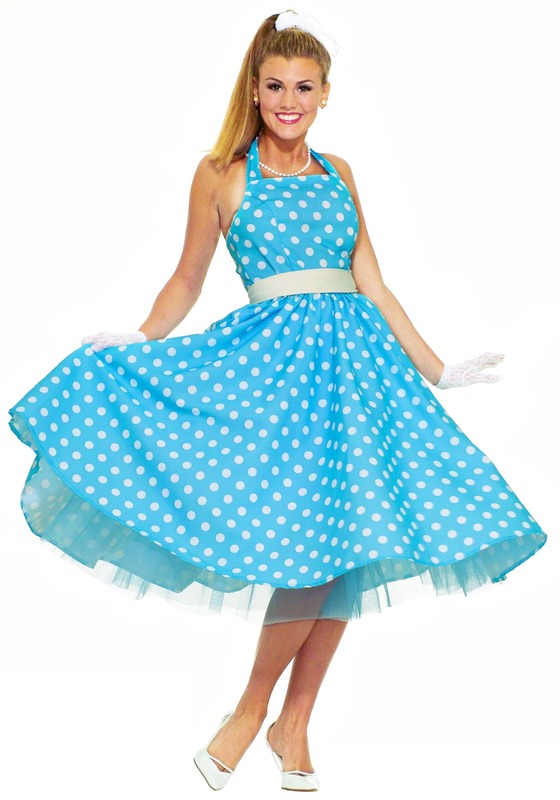 Whether you're swing dancing with a partner or hand jiving solo, wearing this cute halter-style dress will add plenty of '50s pizzazz to any dance floor! The bright colors and flowing ruffled petticoat give your pictures Instagram worthy timeless appeal while the circle skirt makes twirling as you enter a room irresistible! Be sure to add some pearl costume jewelry and a pair of sassy heels to complete your nifty fifties ensemble. So, now that you know how to dress on your vintage-themed outing, have you decided what you're gonna do? We suggest swinging by the malt shop or the drive-in to check out what everyone else is up to, but these days, places like that might be tough to find. Hey, we have an idea for a great way to show off your cheery new look! You could always tape some cardboard fins to the back of your car so it looks like a '57 Chevy, take a video projector and an ice cream maker to the park, and set up your own '50s themed outdoor malt shop drive-in for all your pals. That sounds pretty swell to us! Just don't forget to take plenty photos of you posing in this polka-dot dress, this is one for the books!